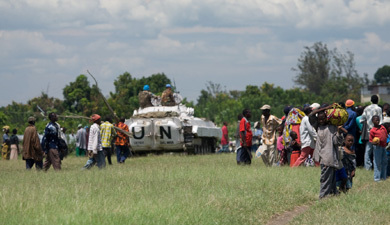 UNITED NATIONS, January 6 -- As in the Congo chaos spreads, the UN on Tuesday said that despite a Security Council resolution authorizing 3000 more peacekeepers, "troop contributing countries have not been forthcoming." Also on Tuesday, the UN could neither confirm nor deny press reports that rebel general Laurent Nkunda has been ousted from the leadership of the CNDP rebels in North Kivu province. Spokesperson Michele Montas told Inner City Press that earlier that morning, the CNDP had told the UN that it would send the same delegation as last time to the next day's peace talks in Nairobi. A question about when anyone in the UN system last spoke with Nkunda went unanswered. Meanwhile, the UN belated reported on the murderous pillaging of towns in the Congo's Orientale Province. Ms. Montas, after describing 70 deaths, 225 kidnappings and 800 houses burned to the ground, told Inner City Press, "I guess you were asking this recently." Video here, at Minute 5. Yes, and at the time, her colleague admonished to keep questions to the UN's humanitarian coordinator John Holmes limited to Gaza. Holmes said it was difficult to know for sure who had done the killings. But Ms. Montas on Tuesday said without equivocation that it was the Lord's Resistance Army. She did not know if UN envoy to the LRA affected areas Joaquim Chissano had received a letter from the LRA requesting an emergency meeting. Likewise, Ms. Montas said she did not know if MONUC has moved any troops to the currently LRA-affected area, to protect civilians, or if any of the 3000 new troops authorized late last year by the Security Council have in fact been deployed. Montas said to "ask DPKO." Video here, from Minute 8:37. But on Monday, Inner City Press asked the head of DPKO, Alain Le Roy, who replied that moving troops to Orientale had not been possible, since the new resolution put all focus on the Kivus. Thus in the country with its largest peacekeeping mission, where it spends $2 billion a year, the UN has sent not a single soldier to stand between civilians and a rampaging war criminal. Miniature Rwandas, echoes of Srebrenica. Operations against LRA elements are being led by Uganda, the DRC and Southern Sudan. While MONUC troops have not been involved in the planning or implementation of these operations they are providing some logistical assistance to FARDC troops in support of efforts to protect the civilian population. While there have been some pledges to MONUC for extra resources, overall TCCs have not been forthcoming. We continue to appeal to troop contributing countries to step forward with firm commitments for the additional authorized troops that are urgently needed on the ground. In the meantime MONUC forces continue to make every effort possible with the resources and manpower available.